The Care Service Food Pantry is the largest food pantry in St. Charles, Lincoln & Warren counties and one of the few offering a client-choice format. Operating since 1981, the Pantry distributes food each week to families and individuals with low incomes who do not have the means for purchasing adequate supplies. By providing food assistance, the Care Service enables families to use scarce financial resources for other household necessities such as housing, utilities, transportation, and medical needs, and move toward maintaining stabilization. The families receiving goods from the Food Pantry are often eligible for other Care Service programs and are identified during assessment appointments. The Care Service also receives referrals from other social service agencies in the area. However, many clients find out about the Food Pantry while at the Care Service for other assistance, such as help with rent or utilities. Over 60 dedicated volunteers help work nine shifts, pick up supplies from over 18 locations, sort, prepare, and distribute food and household goods to about 125 families each week. The Food Pantry is sustained primarily through community support, including donations from civic groups, local schools, churches, and individual families, with a majority of the food and goods being donated on a weekly basis for our clients. 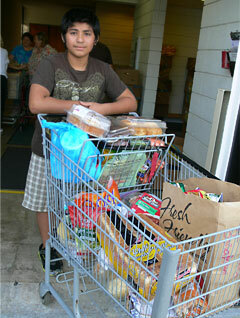 The Food Pantry provides many services to those in need. In addition to weekly food sustenance, clients receive personal hygiene items as available, household cleaning supplies as available, school supplies at the start of the school year, flu shots, Easter baskets for children under 12 years of age, and No Hunger Holiday (Thanksgiving meal). In 2016, the Food Pantry began offering a client choice format, considered a best practice food pantry standard. Those we serve have the opportunity to choose their own foods which allows them a sense of dignity and control. Client choice eliminates waste as people take only what they need and allows them to tailor the assistance they receive to be the best possible fit for their own unique circumstances. Financial contributions and in-kind donations are accepted throughout the year. Financial contributions may be made online via this website, dropped off Monday-Friday 8:30am-4:30pm or mailed to 4116 McClay Road, St. Charles, MO 63304. In-kind donations may be dropped during the same hours. If you have questions about donations of food or personal care items, please contact the Food Pantry at (636) 441-1302, ext. 262. The State of Missouri has re-established the Food Pantry Tax Credit. Donations of food (with receipt) or cash to the Care Service Food Pantry up to $5,000 and made before December 31st are eligible for a 50% tax credit (up to $2,500) on your Missouri tax return. Only tax returns filled out by April 15th are eligible for the tax credit and certain documentation is required. To find out more, visit the Missouri Department of Revenue website, contact your personal tax consultant, or call our Finance Office at (636) 441-1302, extension 260. If making donations to qualify for this tax credit by check, please include the words "Food Pantry" in the memo line. Pantry recipients must be homeless or at-risk of becoming homeless. Family members must be residents of St. Charles, Lincoln or Warren County and must have an income that falls at or below 50% of the area median income level. In addition, a family (or head household) is required to come to the Care Service to be certified. NEED HELP? Call us at the Care Service, (636) 441-1302, and make an appointment for certification. Sponsor our Food Pantry program for the year. This is a wonderful opportunity to be a recognized voice in the fight against homelessness and hunger and to support the local communities where you do business. To find out about the benefits of becoming a Care Service Partner, contact us at (636) 441-1302, extension 263. Kid Friendly Foods - Cereal, Instant Oatmeal, Pop Tarts, Fruit Rollups, Juice Boxes, Peanut Butter Crackers, Graham Crackers, Cheese Crackers, Fruit Cups, Pudding Cups, Fruit Rollups. Toilet paper is always a welcome donation, so if you are looking for a great and easy idea for a collection or drive, help us TP the Pantry! Sign up for our newsletter to stay connected and informed.